Tax is not to be deducted in case amount paid/ payable to a deductee is below prescribed threshold limit. Example : For Professional Fees threshold limit is Rs. 30,000. Earlier there were no clear guidelines for reporting such transactions below threshold. Some deductors were reporting such transactions in statements , others were not. Those who reported such transaction, received notice from income tax department citing this as case of short-deduction. To remove such confusion , now it is required to report such transaction. Mandatory to quote Mobile No. for deductor category other than Central govt. and State Govt. 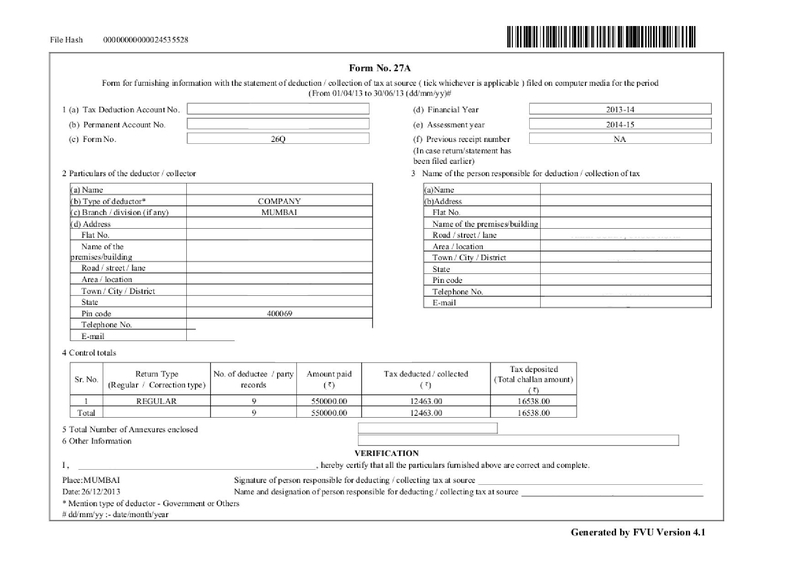 Provision to quote the deduction under section 80CCF in salary details (applicable for 24Q Q4). Surcharge’ amount in salary details should be less than or equal to ‘Total Taxable Income’. ‘Education cess’ amount in salary details should be less than or equal to ‘Total Taxable Income’. ‘Net Income tax payable’ amount in salary details should be less than or equal to ‘Total Taxable Income’. Mandatory to provide section code irrespective of challan update. Book entry flag to be provided in C5 correction (deductee/ collectee PAN update). As of now, deductor has to submit eTDS statement on CD. That too must contain only one eTDS Statement. Now it is possible to submit eTDS Statement in a Pen Drive.